Baklavas is one of the most famous Greek desserts. It is a rich, sweet pastry made of layers of phyllo layers, filled with chopped nuts and drenched in syrup. My mom used to love baklavas and would make it with almonds and cinnamon. This is based on her recipe, although I tweaked her recipe a lot by adding nutmeg and cinnamon and substituted the almonds with pecans and walnuts. I also added quince preserve in the filling and bathed it with quince syrup, I also coated it with chocolate! Just heaven! I recently learnt about pecans and have been using them often since then. They have become a killer combination in this flaky, sticky pastry. In Cyprus we have a lot of almond trees, so it is natural that this dessert is usually made with almonds, which are much cheaper than imported nuts. It is also made with walnuts and pistachios. Pistachios were imported from Aleppo, Syria, known to antiquity as Khalpe, Khalibon. In Cyprus these nuts are called “halepiana”which means from Aleppo, as the Greek name of the city is “Halepi”. Therefore this dessert is also made with pistachios but much more expensive! The multiple layers of phyllo should be brushed with melted butter, preferably clarified, so that they do not stick together. The traditional nut filling is usually made with almonds but many other types of nuts such as walnuts, pistachios or even hazelnuts or a mixture of nuts can be used in the filling. I am not going to explain how we can prove that Baklavas is Greek and not Turkish but, if you like, you may read this article from Wikipedia. Wikipedia, in my opinion, is not a reliable source (although I refer to it often, as I do not find other sources to refer to) as anyone can go and write whatever they want and there is a lot of paid propaganda going on. See Turkish coffee, Turkish delights, moussakas, Turkish baths etc. It seems that the country which had hot tubs more than 3000 years ago, see Knossos, and has spread its civilization throughout the world, used to feed on raw meat and the Nomads would feed on gastronomical food. You may also see the Ancient version of Baklavas, called Gastrin here. To begin making the dessert, we have to make the syrup first so that it cools and then clarify the butter. To do this, heat the butter in a small pan over low heat until it melts. The butter separates in three parts. Skim off foam with a spoon. The milk solids will remain at the bottom of the pan. Strain the butter using a metallic tea strainer or a coffee filter so that the milk solids will be removed. What remains is clarified butter. The quantity I made was huge but every Tuesday we have our Tupperware meetings, so half of it was consumed there. The only change that I made to our traditional recipe was to change the nuts. My mum used to make it only with Almonds and cinnamon, but I made it with pecans and walnuts and added some nutmeg in the filling as well. It was perfect and I am not saying this from what my family said but from what I heard from my Tupperware friends and I was really pleased to see them taking a second piece. Wherever I have eaten baklavas, I find that they use too much syrup and too much butter, which is not the case here. I am submitting this recipe to Aparna, of My Diverse Kitchen, who is hosting the event Think Spice, Think Nutmeg, in Greek Moschokarydo, which means the nut which smells wonderful, originally created by Sunita, of Sunita’s World. A similar chocolate baklavas recipe is included in my cookbook Mint, Cinnamon & Blossom Water, Flavours of Cyprus, Kopiaste! Baklavas is one of the most famous Greek desserts. It is a rich, sweet pastry made of layers of phyllo layers, filled with nuts and drenched in syrup. Combine sugar, honey, water, cinnamon stick, and cloves in a saucepan and bring to a boil. Lower heat and simmer for 5 - 7 minutes. Skim foam forming on top. Add lemon juice, stir and set aside. Clarify the butter (see instructions above). Pulse the nuts with breadcrumbs in a food processor until coarsely ground. Mix in the spices and the quince preserve. Preheat the oven to 160o C and grease a 33 x 40 cm baking tin. Layer 3 sheets of phyllo pastry in the baking tin, brushing each one separately with butter. Sprinkle 1/4 of the nut mixture and add two more buttered sheets on top. Repeat until you add all the phyllo and all the nuts, each time brushing phyllos with butter. Top with the last three phyllo sheets, brushing each phyllo with butter. Wet your hands with water and sprinkle some drops on top. With a very sharp knife cut pastry beginning with a cross, making 4 squares. Each square, cut diagonally making an X and again cut into a cross shape. In each quarter you will get 8 pieces. Repeat with the other quarters. Bake for 1 hour 15 minutes to1 hour 30 minutes or until golden brown. Remove from the oven and pour syrup spoon by spoon making sure that it has penetrated through all pieces. Allow to stand at room temperature 4 - 5 hours before serving. If you are a chocolate lover, try this version as well. Alternatively, you can make baklavas into a coil. It's almost the same method. Brush two or three phyllos with butter and sprinkle some nuts to cover the whole surface. Then fold in the middle and then fold it into a roll. Make a coil and put it in the centre of a 30 cm diametre round baking tin or Pyrex. Repeat until your baking tin is full. Cut the coil into 6 - 8 cm pieces and bake until golden. Add the syrup and set aside until absorbed. Melt the chocolate in a double boiler and mix in the heavy cream, honey, spices and butter. 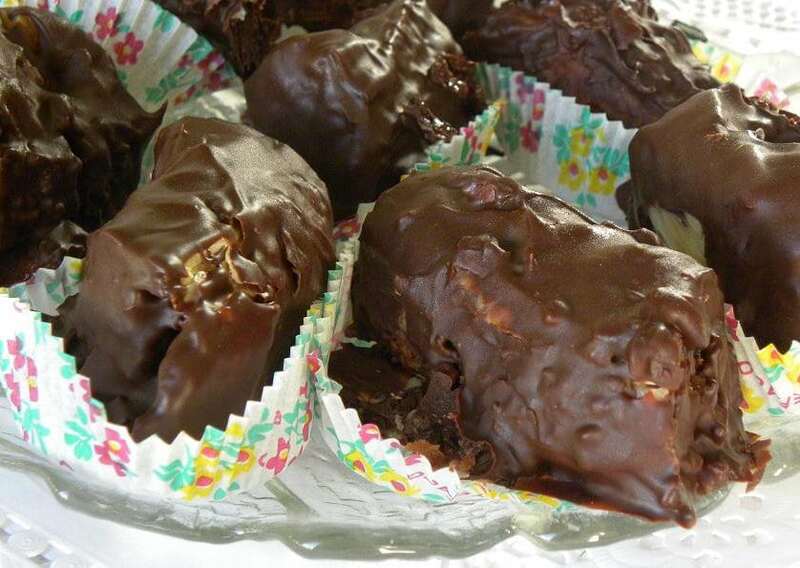 Dip a piece of baklavas at a time in the melted chocolate. Using 2 forks, lift each piece and leave the chocolate to drip off and then place on a wire rack or parchment paper, until the glaze sets. See also my Baklavas Tart. During summer, keep the phyllos covered with a moist napkin, so that they do not dry and crumble. Do not store baklava in the refrigerator as the phyllo will loose its crunchiness and will become soggy. It’s better to leave it in the baking tin, if it’s stainless steel or remove to another vessel and cover with a napkin. Phwoar – Ivy, this loooks delicious!! I am also glad that you used packet phyllo, ’cause making phyllo scares the bejesus out of me (though I tackle it in a pastry class next weekend – yikes!). Cake, I make phyllo for pies but for baklavas it is extremely difficult to make a phyllo this thin. I envy you going to pastry classes. Have you been eating all the pastelli Val? Your baklava looks delicious! I’m always stunned by the variety of baklava there is in the world. A couple years ago a woman I worked with would make me baklava. But she was from Lebanon and I’m sure it was different than yours. Gos Ivy!! You make me crave for this now..I did have a slice for this in the flight to Athens and I had loved it..I can smell all the lovely flavors that you have put in and it smells awesome!! Hey, I was just uploading pics for my new post when I got your comment.. Do have a look!!! Thanks Mary. I have tried Lebanese baklava and it does taste different, maybe it’s the butter they use which gives it a different taste. Swati your new creations are beautiful. Peter, it’s definitely much easier than galaktomboureko and of course bought phyllo is perfect. Guess I was misinformed as I also thought the baklava is Turkish. Lore, it’s easier than it looks. I enjoy all your posts and pictures so much. I’ve tasted the Lebanese baklava from a local bakery. They use different nuts like cashew and pistachio which makes the taste very different. And it is dry. No syrup. I miss my mother’s baklava but I don’t miss the work that went into making the phyllo. what a production that was. If it wasn’t for the premade, I would never attempt this! Hi Alexandra. Nice you see you again. You are right. Lebanese use more pistachios. However, the ones I tried had too much syrup. Ha! We barbarians know who brought us civilization, and it wasn’t the Turks! I’ve been trying to make perfect baklava for a few months now, using roasted soy nuts, because I’m allergic to all nuts. Nothing has been fruitful. Edible, but not great. I will try your mom’s recipe! Thank you! Your mother’s recipe is beautiful and your reproduction of it is gorgeous too. I love love love baklava. I can’t make it at home because I lose all will power. Even when I go to Greektown for dinner – I can smell it in the air and my knees shake. Nikki, sorry to hear about your allergy. Instead of soy nuts how about if you made a filling with dried fruit: dates, apricots, figs, raisins and why not coconut, which by the way goes well with syrup. Oops missed your comment Lulu. I am frustrated with the indifference of the various governments who do nothing to protect our history. Giz, you are right, I cannot resist either and that’s why I don’t make it often. One of these days, when I am feeling like a decadent treat, I’m going to make this. Just lovely Ivy. All those delicious layers are dreamy! I just phyllo dough and need to get more to try to make this! Thank you for yet another wonderful entry, Ivy. I’ll have to find a substitute. Diane thanks and good luck. It’s easy to make. Aparna, I am not sure if you can find a substitute but if you can roll out dough, I can give you the recipe. Nuria, thanks. I wish I could send you some. Oh, I have been crying since moving to Anchorage from Fairbanks. Both cities are in the State of Alaska, USA. There was a very small restaurant in Fairbanks named Suvlaki that made the most wonderful Greek food. Unfortunately the owner decided that running a restaurant was something she didn’t want to do at her age, so it has been closed. Do you have a souvlaki recipe where the meat is thinly sliced and cooked, then placed in the wonderful pita like bread with thin slices of tomatoes and lots of onions and spices. Um, good. Everything I have found here is chunked, tough, meat and not as well flavored. The restaurants I have tried here just don’t do it good, and their baklava is way too sweet. Thank you for your wonderful recipes, and I am on the way to the grocery store to stock up on supplies so I can bake during the weekend. I do have a souvlaki recipe in my blog. However, what you are describing is called Gyros. However, I do not have an actual recipe for gyros as it is not easy to make at home. I have a pseudo-gyros recipe which you can easily make. You can do it with leftover roasted lamb or pork or even chicken, pita bread, some tzatziki (Greek garlic-yogurt sauce), some chopped onion and a dash of dried Greek oregano. Feel free to add or subtract ingredients like tomatoes, mustard and fried potatoes, depending on your tastes. I have tried Lebanese baklava and it does taste different, maybe it’s the butter they use which gives it a different taste. Your mother’s recipe is beautiful and your reproduction of it is gorgeous too. I love love love baklava.